"A great wrap for lunch or dinner. Can be made with all sorts of leftovers, like home made pesto, grilled chicken or that avocado that's going to go bad soon." Place the onion, zucchini, eggplant, mushrooms, and bell pepper into a large container with a tight fitting lid. Drizzle the olive oil over the vegetables and season with salt and pepper. Close the lid and shake to coat. Heat a grill pan or skillet over medium heat. Place the seasoned vegetables on the preheated pan, stir and cook until tender, about 10 minutes. Spread each tortilla with 1 tablespoon goat cheese and 1 tablespoon pesto. Divide the sliced avocado among the tortillas and top with the mixed veggies. 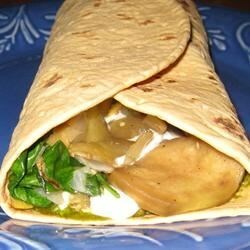 Fold in the bottom of each tortilla and roll each up into a snug wrap. Goes great with leftover grilled chicken for a non-vegetarian option. This was awesome! I made the vegetables one day and then ate the wraps for lunch throughout the week- something delicious to look forward to every afternoon! Not too shabby! I did not add red onion or red pepper because I didn't have them on hand. I did add green pepper, basil and sun dried tomatoes and they were a nice addition. Really tasty! I did not have all the veges from the recipe, but was great with what I had on hand (eggplant, yellow squash, onion, spinich) and sour cream instead of goat cheese. Our absolute favorite dish! We love it! Pesto, Goat Cheese, Veggies....could it get any better?! ?